"What is it?" Chakotay asked. "You wont believe me," BElanna Torres answered. "Except for some modification work and some interesting jury-rigging, none. Certainly nothing we have to worry about." "The...Goddard. On...loan?...from the U.S.S. 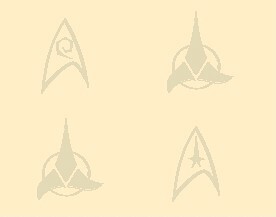 Enterprise." "Starfleet loans them out, now?" "Do we answer the hail?" "They have our position. Unless Starfleet has cloaks now, they came out here and found us alone. Sure, answer them." The words over the speaker were from a very old man. But his voice was clear and distinct. It was a voice the Maquis captain knew almost as well as his own fathers. The message was short, and very simple: "You owe me. Beam us aboard." His engineer thought her captains face-marks were about to fall off. He looked like a little boy, caught, ashamed, and about to be whipped. He assented to the request. "Beam them aboard." His tone suggested that no one smart should raise objection to his orders. No one did, smart or otherwise. He made for the transporter pad. His engineer followed. "Did I ask for back-up?" Actually welcoming her presence, he dropped his objections, and entered the transporter area. Activating the secured mechanism with his command code, he pushed an ungodly amount of buttons meant to frustrate easy-living Starfleet infiltrators. It was old, yes. But they would have no clue how to run it. On the pad, two figures appeared. Both men were above the century mark. Both were legends revered by both Starfleet and Maquis. The captain looked at the man who embodied a Starfleet that had, in his eyes, passed away. Sulu, thinner but hardly frail, nodded. "Hello, Chakotay." Sulu turned to his companion. "Go amuse yourself, Scotty. Chakotay and I have to talk." Captain Scott bristled. "First, I am no lackey, to be dismissed. Second, how do you suggest I go and amuse myself here?" Engineer Torres raised her hand. "I could show you my engines." "Scotty, please, go with her." "Aye, Ill do that. Lassie, I hear you Maquis are first-string improvisers. On my oath of silence...show me everything." Briefly, the wide-eyed cadet in Torres re-emerged at the thought that The Montgomery Scott wanted to see what she had accomplished. They left. "Captain, I cant stay in this position very long." "Take me to your bridge, Chakotay. This wont take very long." "I cant believe you came all this way." Chakotay was smiling. Sulu was not. "I take my sponsorship very, very seriously." Sulu was straight, and to the point with Chakotay, as they walked toward his bridge. The Maquis captain was amazed that a man who was past 130 could still walk unassisted. "Come back with me, Chakotay." "To prison? Thank you. No, sir." Sulu stopped. "Ive obtained a pardon. For you and your crew--except for those who have murdered in cold blood." "What if I believe in the cause Im fighting for?" Sulu nodded. "Lets go to your bridge." In Engineering, Torres was like a little kid, showing off her things. "What do you think, sir?" Scott smiled. "Look at this mish-mash! Some of it pre-dates the first Enterprise I served on. Och! Next youll be showing me a Wagnenstein." Torres took offense. "I do my damnedest with what Ive got. If that isnt good enough"
"Lassie, youre a miracle worker!" Again, Torres heart raced. God had just looked at her playing-card-house, and told her it was a nice little universe. "You know, you people were my idols, even as a kid." "Not to your Klingon family, I take it." "Wellthats odd you say that. Because the Klingons I knew all said that the greatest mistake the Empire ever made was not giving Kirk immortality. My grandmother said that Klingons pray for a worthy opponent, but when one came along, we growled and grew treacherous." "Jim Kirk did a fair bit of growling himself, in his day." On the bridge, Sulu made his final plea. "Youve made quite a name for yourself, Chakotay. My way lets you keep that name and your freedom. I held your hand at the Academy, son. Now this is where you repay me." But Chakotays mind was made up. "Whats the point of keeping my name and my freedom, Captainif your way robs them both of any meaning? If men like you had negotiated that treaty with the Cardiesit would have been abided as the best solution. But weak fools who think theyve learned historys lessons created the Maquis through a Pollyanna attitude about life in this universe. Ive cast my lot with this bunch, and I will not walk away because it costs me." Sulu did not need to say how much he agreed with Chakotay, so he was briefly silent. Out of the corner of his eye, he saw a dark-skinned Vulcan he knew all too well, but chose to say nothing. Captain Sulu held out his hand. "Good luck, Chakotay." As they left the bridge, the man called Tuvok finally breathed. Seska took note. "Starfleet-types make you nervous, Vulcan?" "Indeed. His presencewas no comfort to me." In the transporter room, Torres gave Scott a quick hug. "It was an honor, sir." Chakotay wondered where his cynical half-Klingon officer was. She would return soon enough. "Keep up the good work, BElanna. And always remember who truly runs a ship." There was resolve but no anger as a look passed between Chakotay and his very active sponsor. They were beamed away. Aboard the Goddard, Scott checked for listening devices, and an exhausted Sulu sat down. "How long does he have, Hikaru?" "Not long. There was a Starfleet infiltrator on board. Hes supposed to be goodalthough his service aboard Excelsior left something to be desired." Scott laughed mildly. "We are old, arent we?" "Yes, we are. Was I right to try, Scotty?" "Aye. We are always right to try and serve what is good and proper. You feel that man is still a good officer, then thats all I needed to hear." "Incoming message: private code," the computer announced. Sulu stared at the comm panel. "Who knows your private code?" Scott went to play the message. "Those that remain," he answered obliquely. "Scotty, this is Pete. In circumstances I do not myself understand at this time, Captain Picard has informed me that Uncle Jims body has at long last been recovered. Please return to Earth as quickly as possible. Saavik is working on contacting Spock. If you cannot or do not wish to come, I understand. God bless and keep us all." Sulu stared numbly at the screen. "Kirk. Chakotay. Mentor. Student. I couldnt help either of them, when it came down to it. Hell, I couldnt even help you. If only I hadnt"
Scott brushed aside his words of gloom. "Instead of concentrating on what you were unable to do here, Hikarumay I suggest we go and do the thing that we were unable to do those eighty years ago: say a true goodbye to our captain and friend?" Captain Sulu smiled. Both mentor and student were fine men, and both had counted on him in other times. Regrets had no lasting place in the life of such men. "First star on the right, and straight on til morning, Scotty." Scott smiled despite the grim news that Peter Kirk had delivered; all that mattered was that Jim Kirk was coming home for the last time. And now they could celebrate his life.